As a child, we all had our own snow day superstitions. Perhaps it was the classic: wearing your PJ's inside out, or shouting "Snow Day" into your freezer as loud as you could. Maybe you enjoyed gathering your friends into a circle on the school yard to do a snow day dance. Sometimes it worked and you could enjoy sledding when school got cancelled, but most of the time it failed. Don't feel bad–the weather is out of our control. What is in our control is the ability to bring some of that snow day magic into our homes without the frozen fingers, runny noses and wet socks. Making fake snow is a great option for parents who want to ease the disappointment, albeit a messy one. This is a great sensory activity for young children ages 2 1/2 to 5 and requires minimal supervision. * We advise busting out an extra set of measuring cups so little ones can make snow castles, or supplying buttons and carrots for making mini snowmen. *Note: It is recommended that you make sure your child doesn't eat the fake snow and avoids getting it into their eyes. The best part about making fake snow is that it uses common supplies and materials already found in your home! 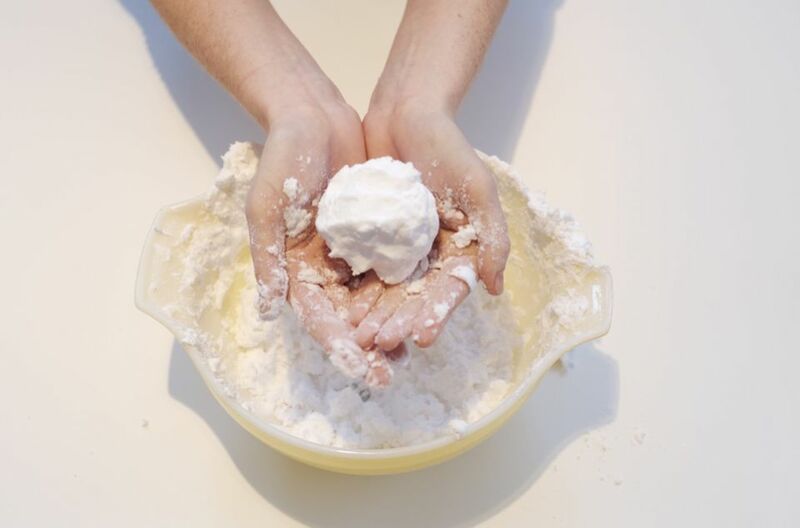 Use the cup measurer to measure out the entire 1lb box of baking soda into the mixing bowl. If you or your kids are impatient, you can just empty the box right in. There is no set amount of shaving cream you need to add in–this is a "per taste" addition. At minimum, add in 1/3 to 1/2 can of shaving cream to the mixing bowl. If you find that your snow isn't holding shape, you can always add more later during play time. Eyeball a few tablespoons of glitter into the mixing bowl. If you want more sparkle, keep adding in the glitter! There is a reason why a mixing spoon was not included in the list of materials–the best part about this project is that you get to get your hands dirty! For this part, roll up your sleeves or your kids' and prepare to get messy! Squeeze the mixture together between your fingers or fold it together like you would a cake batter. There is no wrong way to do this step. Revel in Your Own Snow! Empty the fake snow from the mixing bowl onto a play surface or into a sensory bin. Allow your kids to get creative with how they play with it. Some fun ideas include: using measuring cups to make snow castles, turning snowballs into mini snowmen or using it as a dusting for fake plants in your home. For an added festive touch, turn up the holiday tunes and make a mug of hot chocolate!